Why Be Curious? FUSO21 is our long-term project to bring in authentic, local wines from each of the 21 regions of Italy – wines from real growers rather than from tank farms. We asked some top-notch producers to offer what they usually sell just to locals (“vino sfuso” in Italian). We got some cool stuff, starting with Fuso Barbera from Walter Massa in the Colli Tortonesi in Piemonte. It’s our kind of daily drinker: affordable, natural, minimally filtered, everyday-delicious wine from an interesting growing area (Colli Tortonesi). It’s a real wine for really good pizza or spaghetti. Plus, it’s a natural wine quality-price-ratio hero! Produttore / Producer: One day PortoVino founder Ernest asked Walter Massa (2011 Gambero Rosso Wine Grower of the Year) for a favor: Walter is most famous as the prophet of Timorasso in Colli Tortonesi, but the area has a long tradition for delicious Barbera (including Walter’s Barbera ‘Monleale’). 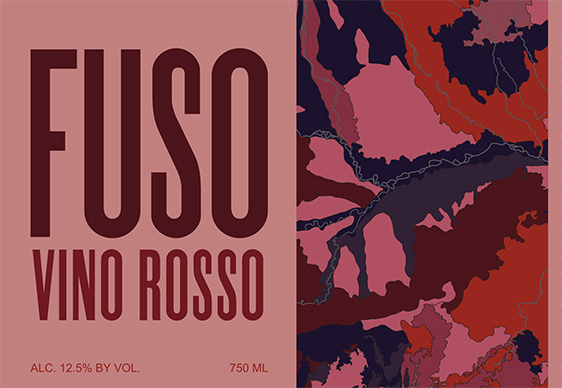 Fuso Barbera isn’t a private label with wine from anywhere; it’s all estate fruit, vinified with a slow, traditional fermentation and aged in concrete tanks. We work closely with Walter to choose the vineyards and make the final cuvée. Nome / Name: Various parcels around Monleale, Piemonte (Colli Tortonesi DOC). Metodo agricolo / Agricultural Technique: Sustainable. Suoli / Type of Soils: clay and chalk. Quota / Altitude: c. 250 meters. Età delle viti / Vine age: 10 – 35 years. Chiarificazione, filtrazione / Clarification, filtratration: Very light filtration. Tappo e bottiglia / Closure and Bottle: Screwcap, 750 ml Burgundy-ish bottle.